Artist's interpretation of the Jupiter Icy Moons Explorer. This month the European Space Agency (ESA) took a major step closer to an ambitious exploration of Jupiter and its icy moons. On July 16, the agency awarded a 350.8 million euros (about $385 million) contract to Airbus Defence & Space in France, whose engineers will design, develop, integrate and test the mission's JUICE spacecraft. JUICE's planned eight-month exploration of Ganymede, the spacecraft's last task, will be the first time any spacecraft has orbited an icy moon. Ganymede is the only moon in the solar system to possess a magnetic field; the spacecraft will focus particularly on that field as well as the moon's crust. Scientists believe Ganymede hides a liquid ocean underneath its surface, and finding evidence of that ocean could provide clues to how planets form and the possibilities of life beyond Earth. 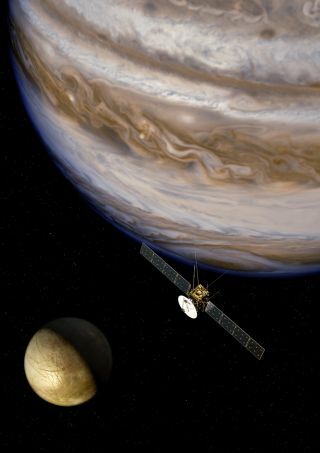 In order to explore Jupiter and its moons, the JUICE spacecraft will be equipped with 10 state-of-the-art instruments, including cameras, spectrometers, an ice-penetrating radar, an altimeter, radio-science experiments, and sensors to monitor the Jovian system's magnetic fields and charged particles, ESA officials said in a statement. Scientists said they expect JUICE to begin examining Jupiter's system in 2030, after an eight-year trip through space.